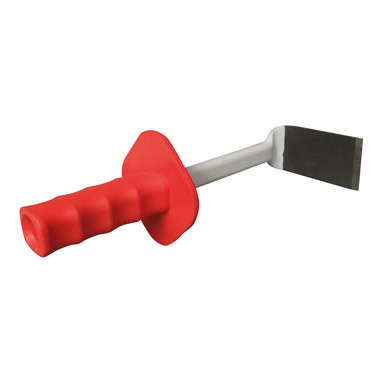 Hand tile chisel especially designed for removing tiles. Ideal for clearing large quantities of tiles from walls and floors. This tile remover has a cranked blade with a wide surface area (50mm width). Simply lever the sharp end of the blade behind the wall tile and strike down (on the wide striking-point where the handle meets the blade) with a hammer. The tile can then be levered off the wall. Can also be used to lever off floor tiles. The robust plastic handle has a hand protector and finger grooves for a firm grip. Made in Sheffield, England from chrome vanadium steel. Should be used with safety glasses. "We have used the wall tile remover several times and found it to be first rate - it removes the tiles easily and best of all you don't get grazed knuckles or hammer bruises! It is better when removing tiles from solid walls as you can use the tool as a lever when you have knocked the cutting blade behind the tiles, which usually brings the tiles off whole or at least in large pieces. On dry lined wall it is not quite as effective as the tool goes into the wall when you try to lever the tiles off. Knocking the tool several times behind each tile to cut through the adhesive, rather than levering the tile off, can overcome this. So yes, we are very impressed with your tools, especially as they both show very little sign of wear after use - which was a concern of mine when I first saw them. Although we are in the business of sticking tiles on rather than removing them, we would certainly recommend these tools as a quicker and therefore more economical way of removing both wall and floor tiles. They also make the job much safer as both tools keep the user's hands away from sharp splinters that tiles always produce."